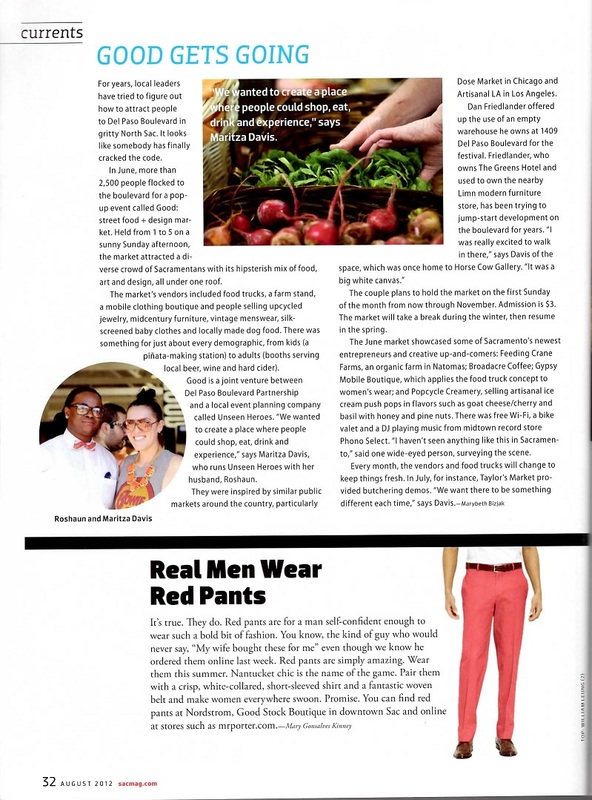 I was very flattered and excited to get a full-page spread in the August 2012 issue of Sacramento Magazine. 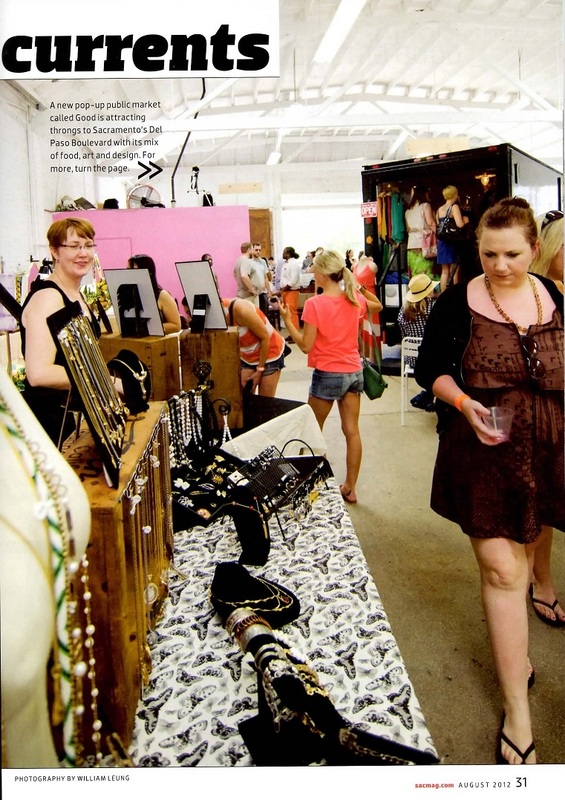 They were covering the GOOD: street food + design market, and chose to feature a picture of my booth at the June show. The only drawback is that they didn’t include my shop name. Oh well, I can’t complain. I was honestly thrilled just to be included. Check out the article below for the details. The beginning of September saw the last of the First Fridays at the Fountains events for 2012. While I love participating in that series of shows, it was a particularly grueling series this year, with the unbearable heat. Or maybe I’m just getting old. Nah, it couldn’t be that. It’s definitely the heat. September also saw my first venture into selling at the Sacramento Antique Faire. It was a hot but fun day. Just wish I hadn’t been fending off a cold! My neighbors were very kind and helpful, and thankfully my good friend Mary was there to commiserate with me, so the day went quickly. Though I don’t think I’ll be doing any more outdoor events this year, I’m definitely planning to sign up for the Faire again next year. I will of course keep you all updated. As of last week, my original designs are featured in two new retail stores, Article Consignment Boutique and La Fem Sophistique. I’m happy to have established a relationship with the lovely Abe and Valerie at Article, as well as Sandi at La Fem Sophistique, all of whom are really supportive and helpful people to work with, who really care about taking care of artists in their local community. Thanks to all of you for giving me such a wonderful opportunity to connect with so many great people! I’m continuing the GOOD: street food and design market through November, and I’m also looking forward to participating in their holiday bazaar the first weekend of December. It should be a blast! I’m solidifying my holiday calendar, and waiting with bated breath to find out if I was accepted for Renegade San Francisco’s Holiday Market in December. I have another week to wait, and I’m getting antsy. If I’m accepted, that will be the largest show I’ve ever done – and I know from being an attendee what fun it is. Please think good thoughts for me, folks. I’d really appreciate it! In the meantime, you can find me at the GOOD: street food + design market this Sunday, October 7th. I look forward to seeing you there! Hey, Amy..Congrats to you..and I love this blog. I bet yah..you will be accepted to Renegade SF.. Thanks, Usa! I appreciate your encouragement. 🙂 I hope all is going well in VA!